This wooded property located on Lake Nokomis faces south with a panoramic view of the lake. 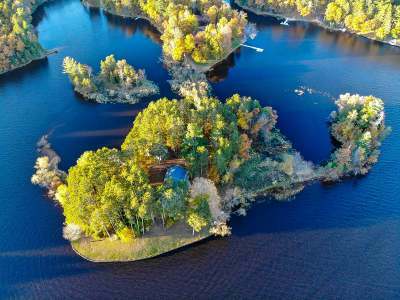 Situated on a 2.6-acre island with over 1928 feet of level sand frontage (first 30 ft owned by WVIC). Open concept with cathedral ceilings, breakfast bar, wet bar with granite countertops, massive lakeside windows, and wood fireplace. The main level has open Living/Kitchen/Dining with wood fireplace and wet bar area. Split level home has a large master bed and bath with huge walk-in closet, 2nd bed and full bath, lower level has 2 additional bedrooms and another full bathroom. Extremely private with access off a private road. Boathouse/Garage with doors both land and lakeside, private landing, and two docks, both a floating and rollout docks, lakefront patio and firepit. Appliances, central vac system, skylights. Appointment only, no drive-ins without prior approval. Furnished and ready for you to come an enjoy. Property has a 3 bedroom septic. House comes with everything in home.